This CellML model can accurately reproduce some published results in orginal paper, but the original model contains time delay factors that cannot be implemented in CellML currently. This time delay factor has been ignored in this current CellML model. ABSTRACT: We present a mathematical model which includes TNF-alpha initiated survival and apoptotic cascades, as well as nuclear transcription of IkappaB. These pathways play a crucial role in deciding cell fate in response to inflammation and infection. Our model incorporates known specific protein-protein interactions as identified by experiments. Using these biochemical interactions, we develop a mathematical model of the NF-kappaB-mediated survival and caspase-mediated apoptosis pathways. Using mass action kinetics, we follow the formation of the survival and late complexes as well as the dynamics of DNA fragmentation. The effect of TNF-alpha concentration on DNA fragmentation is modeled and compares well with experiment. Nuclear transcription is also modeled phenomenologically by means of time lagged cytosolic concentrations. This results in transcription related concentrations undergoing under-damped oscillations, in qualitative and quantitative agreement with experiment. Using a tumor cell as a hypothetical model, we explore the interplay between the components of the survival and apoptotic pathways. Results are presented which make predictions on the limits of cellular oscillations in terms of time delay, initial concentration ratios and other features of the model. The model also makes clear predictions on cell viability in terms of DNA damage within the framework of TNF-alpha stimulus duration. 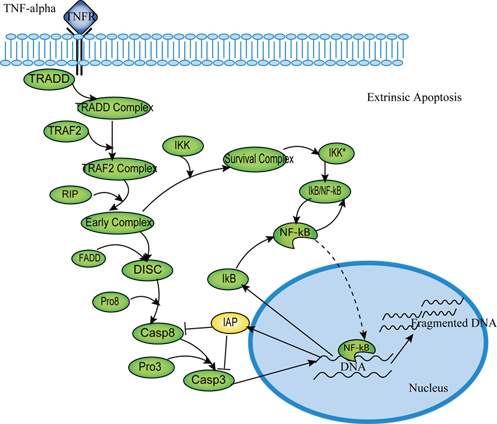 A schematic diagram of the TNF-alpha mediated intrinsic apoptotic pathway and regulation of this pathway by NF-kappaB. Derived from workspace Rangamani 2007 at changeset 34aa0cb2303b.